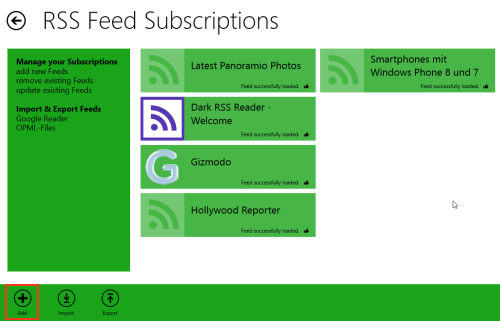 Dark RSS Reader app for Windows 8 lets you fetch content from RSS feeds of your favorite websites. It also provides you the option to read posts within app in a highly convenient manner.This RSS reader Windows 8 app can be easily located under ‘News & Weather / News’ section of Windows Store. Dark RSS Reader app for Windows 8 allows you to manage multiple RSS feeds and is likely to prove quite handy for people who have a taste for reading. The interface for reading webpages eliminates all formatting to present you readable clear text with no distraction. 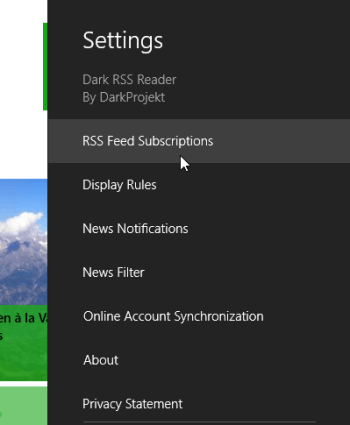 On launching the Dark RSS Reader App For Window 8 for the first time, you will be presented a prompt for allowing the application to run in background. Click on a ’Allow’ button; if reducing battery consumption is not your top-priority. Next, you will be shown thumbnails of various webpages from pre-included RSS Feeds. You access content of webpages by clicking on any thumbnail. So far so good, but the whole implementation won’t make any sense until you include the websites that you really want to follow. Hover mouse to the top-right corner and soon the Windows Charms bar will appear. Next, select ‘Settings’ followed by a click on ‘RSS Feed Subscriptions’. After accomplishing the steps included above, you will be presented RSS Feed Subscription window. There, you can manage the feeds by utilizing the controls in horizontal bar at bottom. To add the RSS feed URL of any new website, you will require clicking on ‘+’ button placed in the left corner after which you will be prompted to enter the feed URL. Type/paste a valid RSS Feed URL and click on OK button. Then after short processing the content will be fetched form the feed and the new heading will become visible. * To remove the RSS feeds entries that you don’t require anymore; select multiple feeds in and press the delete button on “Rss Feed Subscription Window” of . Also, check out our posts on Text Encryption Apps, News Apps, and TuMetro. Open this link in supported web browser such as Internet Explorer 10 or later. 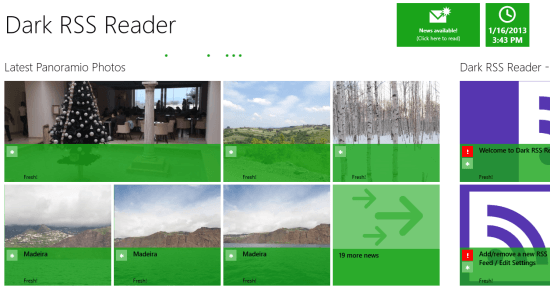 Then click on ‘View in Windows Store’ to the top-left of webpage. Next, click on install button and this 366 KB app will install within minutes. Obviously! this kind of app requires permissions to your Internet. Dark RSS Reader App For Window 8 is definitely a recommendation by my side. You must consider giving it a try.